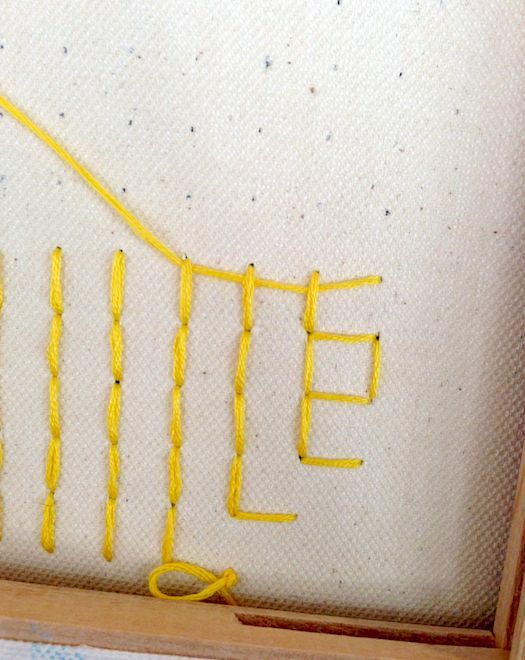 If you love Peeps Easter candy, you adore this cross stitch canvases project! 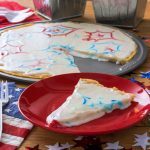 Show everyone just how much you love those sugary covered marshmallow treats with this Peeps Easter craft. Easter is coming up – and though there is a more important meaning, it’s also time for something with a little less substance: the return of marshmallow Peeps to the drugstore. If there’s one thing I know about this candy, it’s that some people love them and some people hate them. Some people also like them a little stale (raising hand). Peep lover or no, you have to admit they are cute. I am paying homage to this tasty, sugary treat today with some cross stitch canvases for Easter decor. Easter Peeps crafts have a special place in my heart, so I’m excited to make something to commemorate them. If you can’t tell, I’ve selected the yellow and pink bunnies as my muses. If you like Peeps too, or even if you just want a fun Easter craft idea, read on to learn how I made them. 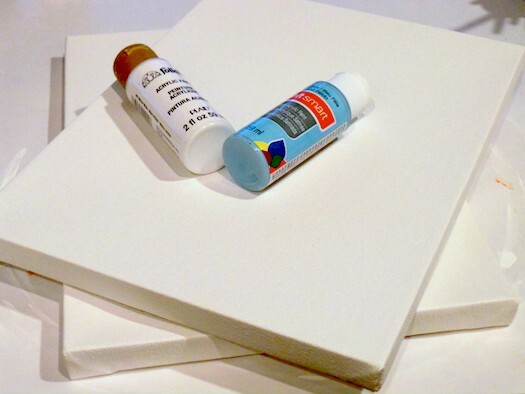 You’ll first want to prepare your canvases by painting them. Paint one blue and the other white. Give them several coats and let them dry. 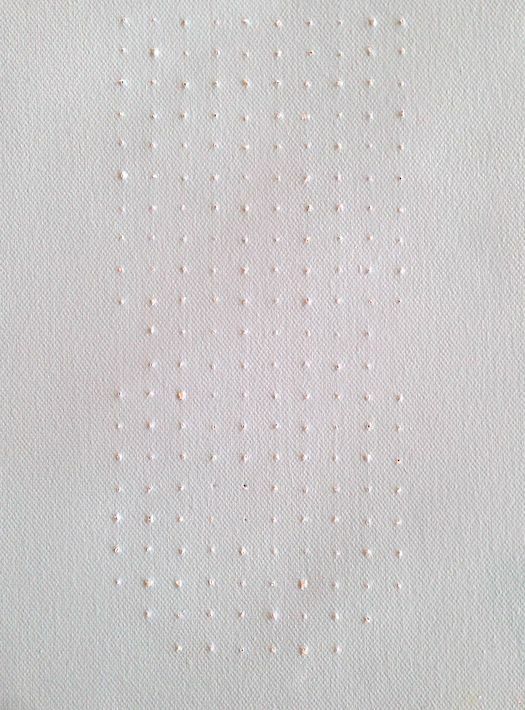 If you’re wondering why you would paint a canvas that is already white, I’ll tell you. The reason is two-fold. First, a canvas isn’t necessarily the shade of white you want for this project. I picked a bright white acrylic paint. 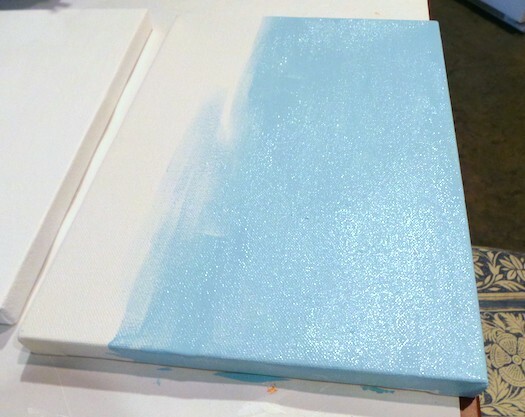 Secondly, you want both canvases to have the same look and finish. If one is painted and the other isn’t, it’ll look strange. Also, blank canvas is really easy to mark up. 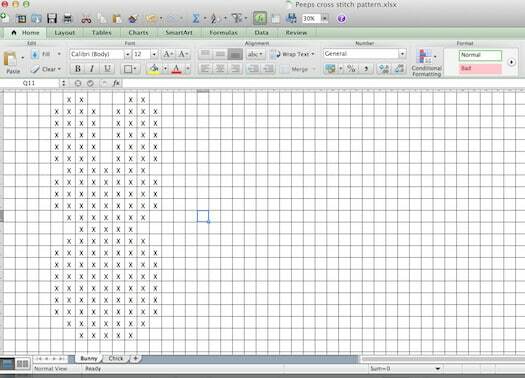 Create your pattern in Excel. I just made a square grid and put “Xs” in the box until it looked right. Then I printed out two patterns to fit my canvases. Start by taping one of the patterns to the inside back of one of the canvases using the stencil tape. 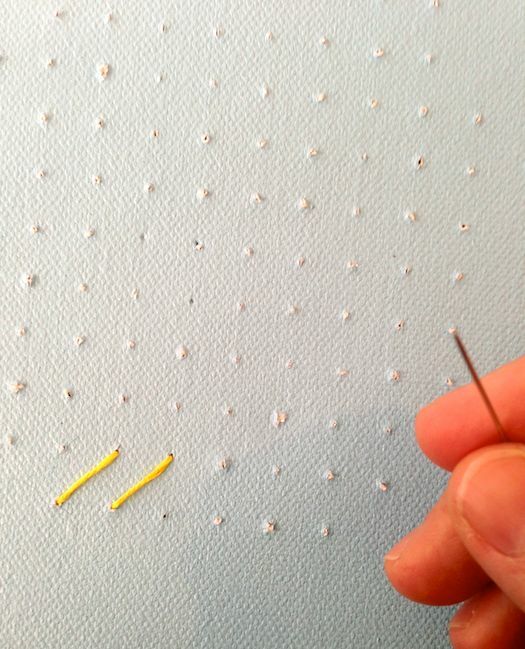 Punch holes in the canvas using the awl (you could probably use a wood BBQ skewer as well). Punch from back to front. Tip: punch lightly so you don’t tear your canvas. You don’t want to manhandle. 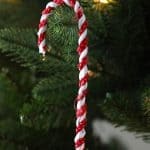 Now you can begin to cross stitch as normal, using an entire strand of floss (don’t separate the threads). If you’ve never cross stitched before, it’s really easy – learn more here. Tie a knot at one end before you begin. 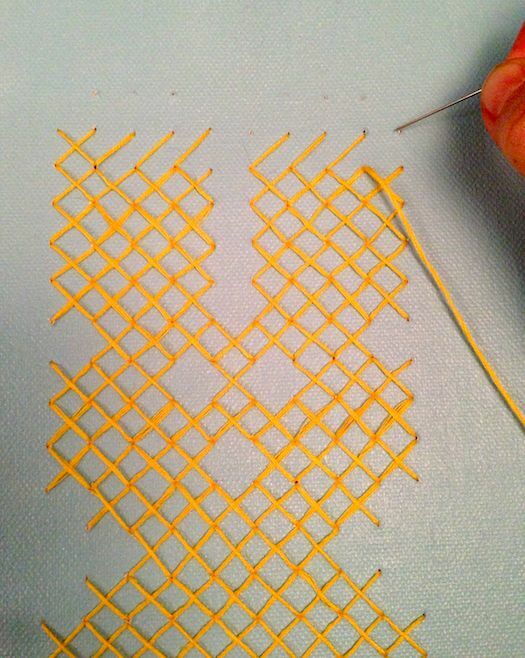 After you finish up cross stitching a strand, thread it through the back of prior stitches. Then start a new strand. 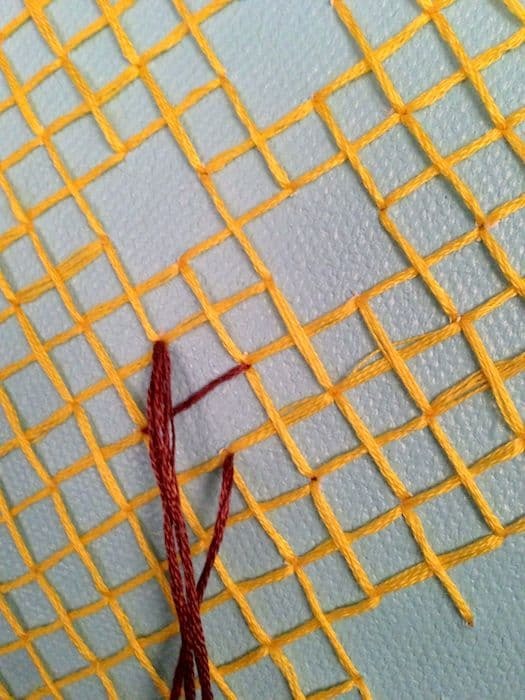 I used yellow thread on top of the blue canvas. Keep going until you finish the body. Then switch to the brown thread to finish the eyes and nose. 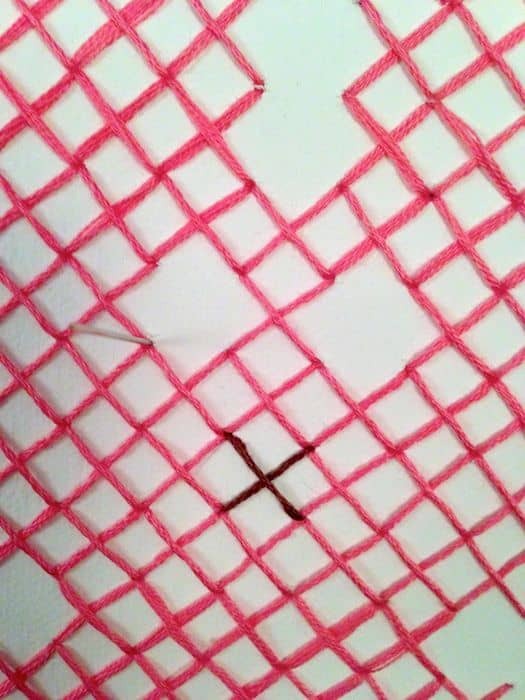 Use the pink thread on the white canvas. I’ll admit, it takes a little bit per canvas. Just sit down and watch your favorite TV show and you’ll be done in no time. I’m so happy with the finished result! I can’t decided which one I like better – yellow Peep or pink Peep? If you weren’t sure before if I liked Peeps, you know now. Now I just need someone to come up with a Peep chick pattern! 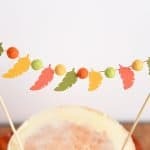 Very cute craft idea!! Super original, I have to give it a whirl! adorable! 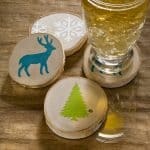 I totally love these! Your bunnys are too cute, too cute! Please do come up with a chicky. They’re my fav.